My assignment was to make a self portrait of some kind. 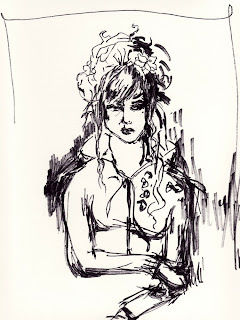 I didn't have much time to spend on it so it's just a quick drawing of how I look right now, with a calligraphy pencil. I'm wearing my favourite leopard hoodie and long johns and I guess I look somewhat annoyed because all sorts of stuff have gone wrong today.